Dimensions 0.75 by 7 by 10 in. What Greek philosopher thought writing would harm a studentâs memory? Was the poet Byronâs daughter the first computer programmer? Who plays more video games, women over 18 or teenage boys? In Alphabet to Internet: Media in Our Lives, Irving Fang looks at each medium of communication through the centuries, asking not only, "What happened?" but also, "How did society change because of this new communication medium?" and, "How are we different as a result?" Examining the impact of different media on a broad, historical scaleâamong them mass printing, the telegraph, film, the internet, and advertisingâAlphabet to Internet takes us from the first scratches of writing and the origins of mail to today's video games, the widespread and daily use of smartphones, and the impact of social media in political uprisings across the globe. A timeline at the end of each chapter places events in perspective and allows students to pinpoint key moments in media history. 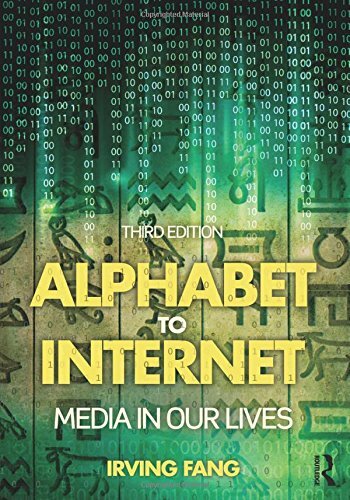 Now in its third edition, Alphabet to Internet presents a lively, thoughtful, and accessible introduction to media history.